On October 16, 2012, at age 68, Anna Saltaformaggio capitalized on the success of her Hammond-based dance troupe with the debut of a second troupe in Ponchatoula. Not one to rest on her laurels, Anna wanted to extend the wonderful benefits of her “Sugar Snaps” dance team to more seniors in Tangipahoa Parish. And so, the “Strawberry Sugar Snaps” were born. Through classes at the Ponchatoula Recreation Park, Anna teaches her new dancers all the right moves, taking them through her creatively choreographed routines. In the process, the performers improve their balance and strength, build new relationships, and treat their community to some fancy footwork. Decades of professional management experience have honed Anna’s leadership and organizational skills. But life experience has taught Anna something more important than the development of these skills: the initiative to take an idea, establish a plan and put those skills to use. She understands that things won’t happen unless someone steps up to the plate to make those dreams a reality. Supported by years of experience, training and learning from her own mistakes, Anna has developed the confidence to grab hold of the reins and lead her teams of novice dancers to surprisingly high-caliber performances. Bringing out the best in her dancers and grooming them for performance requires a great deal of focus, patience and coordination of diverse personalities toward a common goal. But Anna has the right skills for the job. 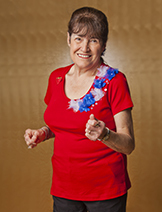 The hard work she puts into motivating her dancers pays off every time they entertain at a nursing home or veterans luncheon. When they strike the final pose and the music wanes, Anna looks into the joyful faces of the crowd. In that moment, she knows that even the most challenging situations in her life held value – because they groomed her to step into the leadership role she holds today. Anna Saltaformaggio… Peoples Health Champion.